Herb Alpert has been known for “Going Places!” since the early ‘60s, when his Tijuana Brass made a worldwide splash. On Friday, October 14, he rolled into the Stoughton Opera House for an intimate show featuring music spanning more than five decades, including fresh tracks from his new album with Lani Hall, Human Nature. Now flanked by a jazz trio, Alpert and Hall had no trouble filling the hall with delightful, often innovative arrangements plucked from The Great American Songbook, the best of Brazilian jazz, and of course the Tijuana Brass repertoire. Admittedly, it’s hard to walk into a Herb Alpert concert and expect to hear anything other than the bright and kitschy ‘Tijuana Brass’ sound. As if to openly defy these expectations, Alpert assumed position at center stage with a muted trumpet in hand. After serenading the crowd with a couple of solo numbers, he and the band rolled into a divine rendition of “Bésame Mucho.” The piece was gratifying on its own, but just as it seemed time to wrap up, Lani Hall stepped up to the mic to join the party. 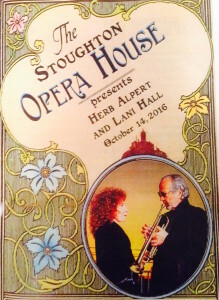 Suddenly, new energy was infused into the hall as Hall showcased the rich voice that made her famous… and captured Alpert’s heart (the two have been married for 42 years). Hall sang with Sérgio Mendes & Brasil ’66 for five years before cutting a solo album in 1972 and earning a Grammy Award for her 1985 album, Es Fácil Amar. This specialty in Brazilian jazz and Latin pop, coupled with Alpert’s bestselling discography which includes South Of the Border, ! !Going Places! !, and Whipped Cream and Other Delights, makes for a the perfect collaboration. Alpert conducted the concert more like a casual living room recital than a nationwide tour by a living legend. He encouraged audience members to freely ask questions of him and his band— musicians he and Hall consider close personal friends. Alpert was also asked about his mute, at which point he directly addressed the prevalent use of it that night. It did seem strange that he was playing into a microphone when an acoustic performance would probably hold up just fine in a smaller space like the Stoughton Opera House. Take away the microphone, put down the mute, and it’ll all be good, right? Well, it was his opinion that playing un-muted would lead to a distorted, overpowering, and generally less pleasing sound. Alright, I’ll buy that. One unexpected turn occurred when the band began a song and Alpert launched into the delightful ballad “I’m Getting Sentimental Over You.” Played in a traditional jazz style, and much more romantic than his rendition on ! !Going Places! !, it struck me that there was something different (almost too straightforward) about this song. The musicians looked at each other as Alpert played. They shared eye contact and started laughing. One might chalk it up to the unspoken language musicians who spend entirely too much time together might share. I did, anyway. It wasn’t until Alpert finished his first passage and turned the spotlight over for a piano solo that he looked back at his band. He leaned in toward the bassist. The two exchanged a few words and Alpert began shaking his head. In fact, he says he hasn’t played “I’m Getting Sentimental Over You” since 1968; he’s not sure where it came from or why he played it. As if to hit the ‘Rewind’ button, the band took it from the top, restarted the same number, and this time Alpert joined along with the correct song, “On the Sunnyside Of the Street.” It hadn’t occurred to me until that moment that these two songs could be so similar that a musician plays one while the rest of the band plays the other— and the two continue onward without a hitch. The debacle was also a testament to the professionalism and versatility of all involved. There was a brief foray across the greatest hits of The Tijuana Brass, from “The Spanish Flea” to “Whipped Cream” and “Bittersweet Samba.” It was probably the most effective way to give the audience what it wanted without spending too much time on this relatively brief era in Alpert’s long career. The night ended on a finale paying tribute to Antônio Carlos Jobim. The medley featured top hits like “Desafinado” and “The Girl From Ipanema.” Those who didn’t get enough of “The Spanish Flea” during the earlier Tijuana Brass throwback got one last taste during “One Note Samba.” The irony of “One Note Samba” is that it’s actually quite difficult to sing, but Hall was on top of each syllable every step of the way. Wrapping up on this tribute to the father of bossa nova was quite possibly the most brilliant move as it allowed all members of the five-piece ensemble to showcase their specialty one last time before taking the final bow. At 81 and 71 years old, respectively, Alpert and Hall proved they haven’t slowed down with age. After packing in over 50 years’ worth of music into just two beautiful hours, the two shared hugs, kisses, and some snuggles on stage before the lights went out. Two hours didn’t seem like enough time together. Let’s hope it won’t be long before the “Tijuana Taxi” cruises back into Wisconsin again.